Vice President for Student Development Jane Neufeld released a new demonstration policy via email on March 17. The new version replaces a policy that had a moratorium placed on it by interim President John Pelissero, Ph.D., on Dec. 8. The new policy allows students to demonstrate without notice anywhere in outdoor, on-campus areas and in the Damen Student Center and Terry Student Center. Protesters may also use amplified sound outdoors, as long as it’s not “substantially” disruptive to class. Demonstrations may not be held during finals weeks. The policy was proposed to students on Feb. 23 and feedback was gathered until March 15. No substantial changes to the policy were made after feedback was received. Much of the feedback had been “highly positive,” according to Pelissero. 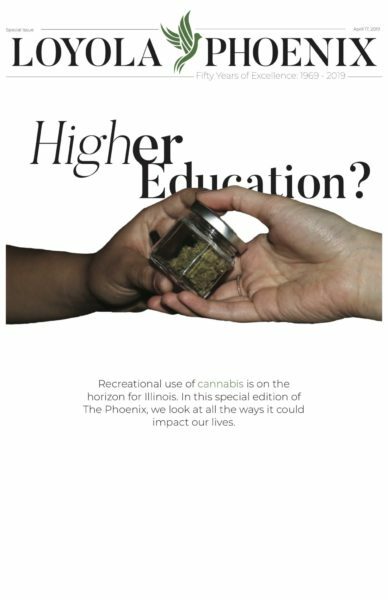 “As one student put it to me, ‘This policy is one in which we got a lot more than we expected to get from the change in policy,’” said Pelissero in an interview with The PHOENIX. Junior Jackson Santy, 20, was pleased when he first read the policy proposal. “As an organizer, I always can applaud small victories because that just means you’re moving closer to your goal,” said the women’s studies and gender studies major. Santy isn’t completely satisfied with the new policy, however, and he said he hopes the administration continues to listen to students. “I really hope that this response from the administration continues to be a trend in them responding to our needs and wants and, arguably, our demands,” said Santy.